DELTA State Governor, Dr Ifeanyi Okowa has challenged the Police to curb kidnapping and other criminal activities in the country. The governor spoke on Wednesday when the Assistant Inspector-General of Police in charge of Zone 5, Mr Alkali Usman paid him a courtesy visit in Asaba. Governor Okowa said, adding, “most of the kidnappings that takes place happen in the highways and that is a cause for worry. 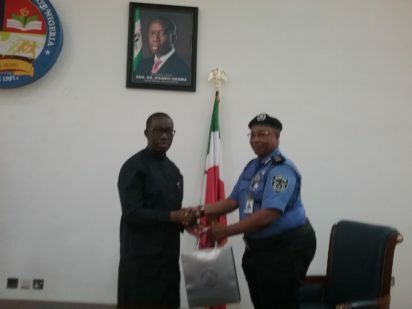 Governor Okowa who congratulated Mr Usman for his appointment as the AIG, expressed confidence that his good knowledge of the terrain would be an asset in making ease, the task of crime control in the zone, noting that as Nigerians prepare for the 2019 general elections, it was important for the Police to be proactive in crime control. He added that politicians too should play by the rules and avoid overheating the polity. Earlier, Mr Usman who was in Asaba with top officers of the Zone, informed the governor that he was on familiarization tour of Police formation in the zone and used the occasion to thank Governor Okowa’s administration for contributing to the success stories of the Police in crime control.